I was working in the yard on an overcast day in 2010 when heavy snow began to fall. The temperature was in the mid-30’s F so snow melted soon after it hit the ground. Nevertheless, it managed to accumulate in some places because flakes were quite large and they fell rapidly. The wind pushed flakes across the dry asphalt to create small piles of snow before the warm temperature produced enough melting to coat the asphalt with liquid water. After enough melting occurred, the liquid prevented additional snow piles from forming. The liquid layer also allowed considerably more light to be reflected by the driveway than when the black asphalt was dry. I could clearly see light variations from trees and the sky on the wet surface of the driveway. The driveway never looked more beautiful and I raced inside to retrieve my 4 inch x 5 inch view camera. The snow was melting rapidly so I quickly mounted a 210 mm lens on the camera and composed a photograph. The composition contained left-to-right visual movement and incorporated bright tones from piles of snow, mid-tones from the sky reflected by wet asphalt and dark tones from trees reflected by wet asphalt. The view camera lens was tilted forward to position its focused area onto the plane of the driveway. Light meter readings were acquired quickly and the dark tree reflections were placed midway between Zones II (dark with slight detail) and III (dark with good detail). That caused bright snow piles to fall midway between Zones VII (bright with good detail) and VIII (bright with slight detail). Photographs which contain large areas with little or no texture generally look unsatisfactory to me so I wrote N-0.5 on the film’s exposure record to remind me to develop the film slightly less than its normal development time. That lowered bright snow tones half an f-stop (from Zone VII.5 to Zone VII) to ensure that the snow contained plenty of texture. My light meter provided many possible shutter speed/f-stop combinations and I chose 1/30 sec at f/22. Melting occurred very fast and the scene was changing by the second so two different Tri-X 4 inch x 5 inch black & white films were exposed in an effort to capture at least one good composition. I instructed my scanner to produce a high resolution digital file from the film at my usual resolution of 5,000 ppi and 16-bit pixel depth. 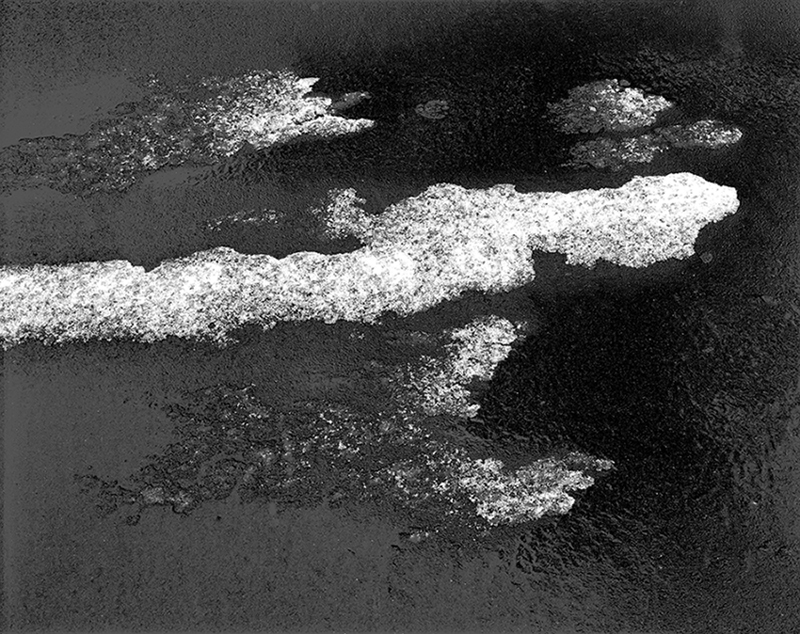 The digital image obtained from the scanner without editing is shown below. I liked the composition, especially its abstractness and its left-to-right visual movement. However, I also thought the image felt heavy and looked two-dimensional. 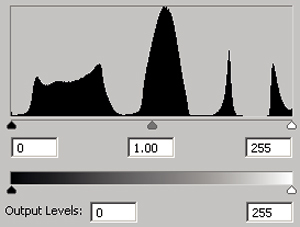 The histogram of the scanner file is shown below with dark-to-light tones displayed from left-to-right. Although the file from my scanner had 16-bit pixel depth (65,536 possible gray levels), PhotoShop provides histograms with only 8-bit pixel depth (256 possible gray levels) because the smaller numbers are easier to comprehend. However, the actual gray level resolution of my image was 16-bit. 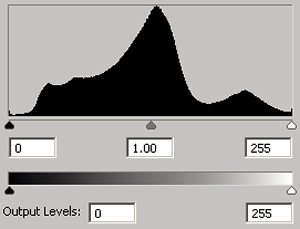 The histogram shows that the scanned image contained the full range of gray tones (0 – 255 in 8-bit terms or 0 – 65,536 in 16-bit terms). The histogram also shows that the vast majority of pixels were distributed in the darkest third of the film’s tonal values which explains why the image felt heavy. I spent some time studying the image and defined three editing goals: reduce heaviness, increase depth (i.e. increase its sense of three-dimensional structure) and strengthen left-to-right visual movement. The original image was copied and PhotoShop’s Shadow/Highlight adjustment tool was opened for the new layer. Dark pixels were brightened substantially with the “shadow” controls of the Shadow/Highlight tool. Then, the opacity of the new layer was varied until the reflected sky was brightened satisfactorily. That point was achieved when the new layer had 57% opacity. The image which combines the original scanned layer and 57% of the Shadow/Highlight layer is shown below. Heaviness clearly was reduced by the Shadow/Highlight adjustment. The histogram for the previous image verifies that the majority of pixels occupied mid-tones rather than dark tones as for the unadjusted image. Next, textures were strengthened. I seldom posterize photographs but know that it can produce interesting changes in image tones. For black & white photos, posterization involves reducing the number of possible gray tones (i.e. reduce pixel depth). Having fewer gray tones means that differences between gray tones are larger and tonal banding is observed when gray tone differences are large enough to be visible to the naked eye. Black and white digital photographs with 8-bit pixel depth contain pixels that vary among 256 possible gray levels. In reality, 256 gray levels are enough to avoid visible banding but digital editing commonly compresses the gray level range enough to produce tonal banding. Consequently, it generally is desirable to acquire photos with a pixel depth that is larger than 8-bit to provide a cushion which allows editing to occur without producing banding. I scan my film to obtain digital files with 16-bit pixel depth so pixel tones vary among 65,536 possible gray levels. Pixels in my 16-bit images have plenty of gray levels so digital editing rarely produces banding. Why would I reduce the number of gray levels in today’s image with a posterize adjustment? The answer is that texture is exaggerated by posterization because larger tonal changes are created between gray levels when the number of gray levels is reduced. Today’s photograph is a good candidate for posterization because it contains no large areas with gradual tonal changes (e.g. sky) where distracting banding would be produced so texture can be increased without producing banding that dominates the photo undesirably. A posterize adjustment layer was opened for today’s photo and placed below the Shadow/Highlights layer. I viewed the image as I varied its number of gray levels. Texture was increased best when the number of gray levels was reduced to only four. 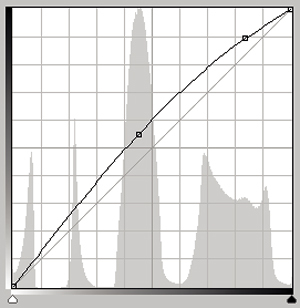 The histogram for the image with no adjustments except posterization is shown below. 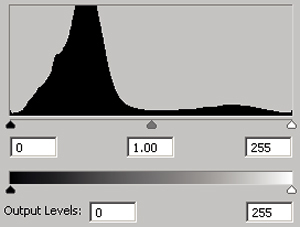 Note that the histogram contains only four gray levels – pure black, a gray that is darken than middle gray, a gray that is lighter than middle gray and pure white. The photograph with no adjustments except posterization is shown below. Note that the image contains only four gray levels – pure black, a gray that is darken than middle gray, a gray that is lighter than middle gray and pure white. Comparing the following and previous images show that posterization increased image texture considerably. Except for improved texture, however, the posterization adjustment looks like a step in the wrong direction since the image became darker and heavier as a result of posterization. However, the previous image and its histogram showed the results of posterization without other adjustments (the Shadow/Highlight layer was turned off) simply to illustrate the process of posterization. Recall, that the posterize layer was placed below the Shadow/Highlight layer so the Shadow/Highlight adjustment affects the posterize layer beneath it. The image below shows the actual editing result when both Shadow/Highlight and Posterization adjustments were performed. That is, the Shadow/Highlight layer was turned on so it affected the Posterize adjustment below it. The result is clearly different than the previous image. The affect of brightening dark pixels with the Shadow/Highlight adjustment is now evident and much of the texture enhancement achieved with the posterize tool also is evident, especially for the dark tree reflections. The increased texture helped the image feel more three-dimensional because snow piles were pulled forward and tree shadows were pushed backward. The histogram for the previous image shows the combined affects of Shadow/Highlight and Posterize adjustments. The four widely separated gray levels of the posterized histogram were broadened by the Shadow/Highlight adjustment to produce the resultant histogram below. Comparing the figure below with the histogram after the Shadow/Highlight adjustment shows how posterization changed the histogram. The smooth histogram curve after Shadow/Highlight adjustment was segmented into four nearly separate gray tone groups by posterization. Compared to the unadjusted scanned image, the result of the two adjustments was an increased number of midtone pixels (Shadow/Highlight adjustment) along with increased image texture and three-dimensional depth (Posterize adjustment). A test print was made to evaluate my editing progress and it showed that I had overdone tonal brightening so a Curve Adjustment layer was opened to tune-up the image a bit. 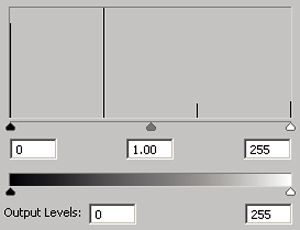 Its user interface is shown below with dark-to-light tones displayed from right-to-left (note that the previous histograms displayed dark-to-light tones from left-to-right) and top-to-bottom. The linear curve was bent up to darken all pixels except pure white and pure black. Finally, retouching was performed. Parts of three small snow piles were brightened with PhotoShop’s Dodge tool to increase their visual importance. They were the two upper and the lowest snow piles. Although areas which were brightened in the piles were not large, comparing the following image to the previous image shows that retouching was important. Retouching the three snow piles helped draw viewer’s eyes up and down from the largest snow pile. In addition, left-to-right visual movement was strengthened slightly because brightening occurred mainly on the right side of the three piles. Areas of wet asphalt also were retouched by darkening small areas of midtone pixels to turn the eye into the image better. The upper right corner, lower right corner and lower image edge were darkened with PhotoShop’s Burn tool. Two tiny but annoying bright snow particles located at the upper and lower perimeters of the largest snow pile on the image left edge were darkened to help keep the eye from falling off of the left side of the image. These particles are barely visible in the small web images shown here but are prominent in large prints. The subject of this photograph was an asphalt driveway after a snowfall. I believe the image shows good left-to-right visual movement, good three-dimension depth for such a shallow scene and it is nicely abstract.